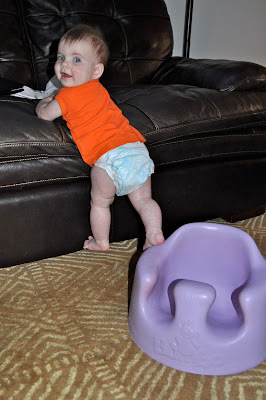 Rambles and Ruminations: Trouble With A Capital "B" and/or "C"
Trouble With A Capital "B" and/or "C"
Did you hear about the Bumbo seat recall? If by some miracle you haven't, you can read about it here. but, we might just get rid of the Bumbo anyway. PS I came into the room on the day of the recall to find her like this -- it's hard to tell from the photos, but she is about 8 inches off the ground with just one foot on the Bumbo and the other floating in mid-air. I have no idea how she managed to get into this position. It looks like she is using it as a step stool. 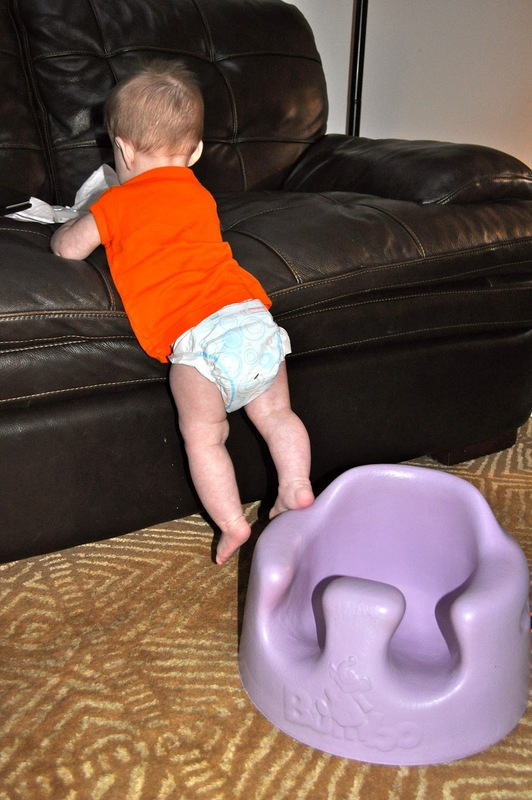 The recall doesn't say anything about not using the Bumbo to elevate yourself...it simply says not to use it on an elevated surface. She has it on the floor exactly like she is supposed to. Brilliant.